Financial regulation: Can we avoid another great recession? Following the Global Crisis, a number of significant regulatory reforms have helped to improve both crisis prevention and crisis management systems. Yet an effective financial supervisory architecture is essential to optimise the positive effect of the post-crisis reforms. When referring to a financial supervisory architecture, we mean an institutional supervisory setup that: (i) assigns specific functions to individual financial authorities; (ii) establishes coordination and cooperation mechanisms among those authorities; and (iii) specifies other approaches and arrangements to avoid potential conflicts of mandates. Deciding on the above institutional issues generally entails trade-offs between synergies across functions and potentially conflicting goals. In addition, the choices are influenced by the structure of the financial sector, past experience with financial crises, and legal, historical, cultural and political economy considerations. Moreover, the effectiveness of a financial supervisory architecture is very much related to the financial authorities’ ability to act with clear objectives, operational autonomy, comprehensive and effective powers, sufficient resources and adequate incentives. Accordingly, jurisdictions have assigned financial sector responsibilities to authorities in line with a variety of institutional setups that roughly correspond to one of the following financial supervisory models: sectoral (i.e., separate authorities supervising different financial sectors); integrated (i.e., a single supervisory agency responsible for overseeing the financial sector); or partially integrated.1 The latter generally includes the Twin Peaks model (i.e., two different agencies in charge of prudential oversight and conduct of business for all types of financial institutions, respectively) and the Two Agency model (i.e., one agency responsible for supervising both solvency and consumer/investor protection for banks and insurance companies, and a second agency responsible for market integrity as well as securities business).2 A key feature of any financial supervisory model is the particular role assigned to central banks in the context of financial sector oversight. Despite some movement towards integrated arrangements, the prevailing financial supervisory model continues to be sectoral. There have been incremental but important changes within existing financial supervisory models. Central banks have acquired more financial oversight responsibilities after the Global Crisis. A significant number of jurisdictions have enhanced or are in the process of enhancing their consumer/investor protection supervision. Since the onset of the Global Crisis, a limited number of jurisdictions have changed their financial supervisory models (close to 15% of jurisdictions in the sample – Table 1). Most jurisdictions that reported changes have been shifting away from a sectoral model towards a more integrated one. Despite the importance of these changes, they have not crystallised into a preferred model. In fact, the prevailing model of financial sector supervision continues to be sectoral. Table 2 displays the regional breakdown. Source: Calvo et al. (2018). Our study shows that, after the Global Crisis, a number of jurisdictions have adjusted their existing supervisory models to: (i) incorporate new functions, such as macroprudential policies (Table 3) and resolution; (ii) improve the monitoring of financial stability (Table 4); and (iii) enhance the institutional setup for consumer/investor protection supervision. Many jurisdictions have adopted or enhanced their macroprudential policy frameworks. This has included modifying legislation to adopt new macroprudential tools and assigning them to existing or newly created authorities. In fact, 86% of jurisdictions indicated that they have set up a macroprudential authority. In 25% of jurisdictions, specific bodies have been created with the purpose of either activating or recommending macroprudential policies. Finally, most of the jurisdictions in the survey indicated that they have introduced changes in the setup to monitor financial stability, typically by setting up inter-agency committees. Note: The green dots represent the specific institutional setup for monitoring financial stability mentioned in the corresponding row (i.e., dedicated committee, financial stability coordination committee or financial stability unit or department). The last column shows the number of jurisdictions in which that institutional setup operates (e.g., 21 jurisdictions in which there is a dedicated committee for monitoring financial stability). More than one green dot per column represents more than one authority responsible for monitoring financial stability, and the last row shows the number of jurisdictions in which a specific combination of authorities exists (e.g., three jurisdictions in which there is a dedicated committee and a financial stability unit/department for monitoring financial stability). A critical new function for financial authorities stems from new resolution standards.4 Most of the observed changes in resolution regimes since the Global Crisis (40% of jurisdictions) have taken place in Financial Stability Board member jurisdictions and EU countries (30% of jurisdictions), mostly home jurisdictions of global systemically important banks. Among the respondents, nearly 25% of jurisdictions have announced plans to change their resolution framework. Therefore, changes in the institutional setup of resolution regimes continue to be work in progress. The post-Global Crisis changes broadly point to models where the central bank has a more central role in prudential supervision (Table 5). These include the ‘integrated central bank’ model, the Twin Peaks model (where the prudential ‘peak’ is located at the central bank), and the Two Agency model (where the central bank hosts the supervisory authority for banks and insurance companies). More specifically, nearly a third of crisis-affected jurisdictions5have changed their model and have tended to give more supervisory powers to their central banks. Moreover, central banks remain the predominant primary microprudential banking supervisor,6,7 with even more reallocation of supervisory responsibility for banks from single supervisory agencies to central banks. Central banks are also the lead authority for macroprudential policy in most jurisdictions. Macroprudential responsibilities are more likely to be given to the central bank when the central bank is also the microprudential supervisor for banking. Dedicated committees8 are responsible for macroprudential policy in a number of jurisdictions and typically include government representatives, central bankers and supervisory officials. The macroprudential responsibility is largely aligned with the banking microprudential responsibility when central banks are also in charge of the latter (close to 80% of the cases). Source: Calvo et al. (2018) and Financial Stability Institute staff calculations. Significant changes in the institutional setup for consumer/investor protection have taken place since the Global Crisis (Table 6). These changes include new oversight powers for conduct-of-business rules, new dispute resolution procedures, and the creation of new bodies or specialised departments within existing agencies. The most common type of reported change is the establishment of either a new unit or a department dedicated to consumer protection within the supervisory authority. The changes have affected all three financial sectors, although this has not led to the creation of an integrated supervisor for the conduct of business. Nevertheless, further changes are expected, as indicated in the responses from a number of jurisdictions. In many cases, consumer/investor protection supervision is performed by more than one agency. In a number of jurisdictions, a dedicated consumer protection agency has a wide set of responsibilities to protect consumer interests. In the case of financial products, this function is mostly shared with other authorities. The prudential supervisor, independent of the chosen supervisory model, is in most cases responsible for consumer/investor protection in connection with banking products. In the case of insurance products, the supervision of consumer protection is predominantly located in a single supervisory agency. Single supervisory agencies, by a large majority, have responsibility for investor protection in the securities sector. Source: Calvo et al (2018). Since the onset of the Global Crisis, a limited number of jurisdictions have changed their financial supervisory models but a significant number have made adjustments within their existing models to incorporate resolution, macroprudential and other financial stability functions. Largely due to these adjustments, central banks have taken on more financial oversight responsibilities. Another important observation from our study relates to the institutional adjustments that have taken place, or are in the process of taking place, to strengthen consumer/investor protection supervision. Finally, it is worth pointing out that there has not been a clear convergence towards a single preferred financial supervisory model after the Global Crisis. This result, however, is consistent with the different trade-offs that supervisory models face and perhaps the lack of one-size-fits-all formulae to appropriately deal with those trade-offs across different jurisdictions. Calvo, D, J C Crisanto, S Hohl and O Pascual (2018), “Financial supervisory architecture: What has changed after the crisis?”, Financial Stability Institute papers 8, Bank for International Settlements. Financial Stability Board (2014), “Key attributes of effective resolution regimes for financial institutions”. Financial Stability Institute (2007), “Institutional arrangements for financial sector supervision: Results of the 2006 FSI survey”, Occasional paper 7. The sectoral supervisory model involves three separate authorities supervising three different financial sectors – banking, insurance and securities. Each authority typically has a prudential role and a conduct-of-business role in the sector it supervises. The integrated supervisory model involves a single agency – which could be the central bank or a single supervisory agency – which is responsible for both prudential and conduct-of-business functions in all three sectors. In the partially integrated supervisory model, financial sector responsibilities are grouped according to supervisory objectives or financial sectors. Despite this broad classification, in practice, a number of jurisdictions have implemented various forms of hybrid supervisory models. For instance, in countries with integrated supervisors, there often exist separate agencies with specific investor/consumer protection responsibilities. In addition, in jurisdictions with separate agencies for prudential monitoring and conduct-of-business supervision, the prudential oversight of investment firms or asset managers is often assigned to the latter. See Financial Stability Institute (2007). See Financial Stability Board (2014). There are 19 crisis-affected jurisdictions in our sample. 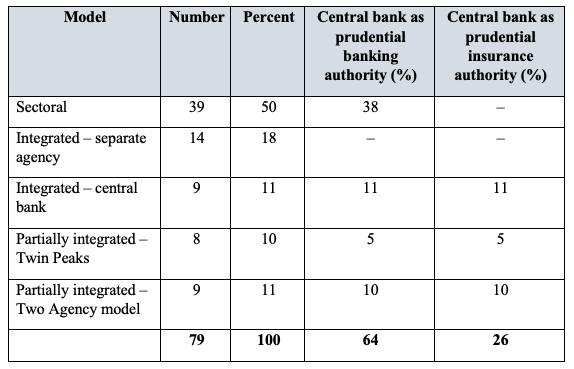 Two thirds of the jurisdictions assign banking supervision to the central bank and about one third allocate it to a single supervisory agency. In contrast to banking, the supervision of insurance companies is performed by a single supervisory agency in about two thirds of cases. The role of single supervisory agencies is even more predominant in the regulation and supervision of securities business and securities firms. This is conducted by a single supervisory agency in slightly more than 80% of cases. The main change in the supervision of the insurance sector has been migration from a single supervisory agency to the central bank (close to 9% of jurisdictions). Only a few changes have been observed since the Global Crisis regarding the location of the microprudential supervisor for securities firms. The main shift in responsibilities has been a reassignment from a single supervisory agency to the central bank, in line with other financial sectors. These are inter-agency councils with a macroprudential orientation. Central banks are involved in more than 70% of jurisdictions, while single supervisory agencies participate in the resolution process in 35% of jurisdictions. A specialised resolution authority, a dedicated authority or a deposit insurance agency outside the central bank exist in close to 25% of jurisdictions. The Bank for International Settlements was unable to classify three countries – Cyprus, the Kyrgyz Republic and Timor-Leste.